Imperatori Decks: Imperatori and Karnöffel, steps before Tarot. Research of the history of Tarot. There is not much before 1440, which points to an existence of Trionfi decks before 1440 and nothing has the quality of a sure indication. The time of 1370 - 1420, the first 50 years of a broad existence of playings cards in Europe, is filled with card playing prohibitions and few notes about the production of playing cards. The most important document is the text of Johannes of Rheinfelden (1377), which includes the description of a 60-cards deck, which seems to have had a relationship to the game of Chess and the survived Hofämterspiel (ca. 1455). More interesting are the 20ies of 15th century, here we have some relevant documents and also a few still existent playing cards, which might have been produced at this time - or a little later (probably later). We believe, that Imperatori cards were similar to Trionfi cards, but had less trumps or special figures. When Trionfi cards became a farspread deck type (after 1450), the Imperatori decks disappeared. We think, they merged in the Trionfi game. Also we believe, that the Chess game took an influence upon the idea of the play of Karnöffel and the Imperatori decks. It's rather clear, that the Michelino deck - although rather different from the standard Tarot deck - could be perceived by the contemporary Jacopo Antonio Marcello as a "Trionfi deck". Also it seems clear, that it was produced in or earlier than 1425. Can we assume the existence of similar decks around this time? We think not. Marcello calls Filippo Maria Visconti an inventor. At another place we argument, that the Trionfi deck after 1440 had a 5x14-structure (or perhaps a 5x16-structure), before they arrived near to the later form with 4x14 number and court cards and 22 special cards (21 trumps and a Fool). The riddle is, what was before 1440? And with that problem we've to find an answer to the question: What are Imperatori cards? Did they have a relation to the game of Karnöffel? Were they a special type of Trionfi deck? Did they've special motifs like Trionfi cards? And if - which were these special motifs? And last not least: Were there a similarity of the Imperatori decks to the game of chess? Of course all our suggestions to this theme "Imperatori" are highly speculative. There is simply the problem, that there are not much documents. Before 1420: The council of Constance might have refreshed the Italian interest in playing cards. 1420 - 1429: Moderate playing card laws by Filippo Maria Visconti in the region of Milan. Less moderate prohibitions in and around Florence. 1422: First note of playing cards at the court in Ferrara, which later becomes the major source for Trionfi documents. 1423: San Bernardino preaches against card playing. From this source we know, that the 4x14-deck structure exists. 1423: Parisina imports 8 Imperatori cards from Florence. 1424/1425 (? ): Latest date for the Michelino deck. 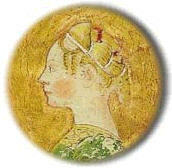 1425: Parisina is beheaded. Playing card notes in Ferrara take a pause. 1425: Trionfo in Milano for Filippo Maria Visconti. 1426: The game Karnöffel is mentioned in Nördlingen, southern Germany. 1427 - 1431: The oldest still existing German luxury cards. 1439: It seems, that in the year of the Council of Florence the Italian interests in Trionfo festivities is raised. Chess was the great game of 14th century. In the 20ies it seems that chess still was the recommended game for noble men, playing cards seem to have been something for noble women. It was natural to transport chess ideas and figures to the playing card deck - already Johannes of Rheinfelden reports that. Imperatori decks appear in Ferrara 1423, as an import from Florence. Much later (1443) they reappear - only in Ferrara - short after the production of some Trionfi decks in 1442. Then again a pause occured, neither Trionfi decks or Imperatori cards are mentioned till 1450. In 1450 Imperatori cards reappear - again after Leonello commissioned some Trionfi decks in spring 1450. Then Trionfi became a much played game and Imperatori decks disappeared forever. In 1441 some young girls are in a creative situation. They know the Michelino deck and they know Imperatori decks. And a great event, a marriage, is projected. We've to assume, that card-playing was a female domain - and perhaps we've to assume, that these young girls took a deciding influence upon the first Trionfi decks. In 1426 in Nördlingen in southern Germany the game Karnöffel is mentioned as an allowed game. From later informations we do know, that this game was also called "Kaiserspiel" or Ludus Caesarum, that is Emperors game and just a very similar name as "Imperatori". However, from later informations we also know, that Karnöffel didn' use special cards but just defined normal cards with a special meaning: Pope, Emperor, Devil etc.., that are figures, which also appear in the Trionfi or Tarot game. We assume, that Imperatori cards and Karnöffel were not identical, but had the same origin, that is a game probably played in the free time at the council of Constance. The name Karnöffel is a riddle. Some decks have an unclear state, we cannot decide with security, if they were produced before 1440 or after this date.